<---- Susan's Cheesy Anmimated Greeting Cards! The Ramos Web - My recipes, Desktop Calendar, Cool Site Picks, and More! 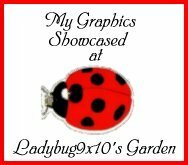 Ladybug Crossing - Free Graphics and more!